Get outdoors at Edakkal Caves and Soochippara Falls (Sentinel Rock Waterfall). Explore the numerous day-trip ideas around Kalpetta: Vythiri (Banasura Sagar Dam & Thariode), Wayanad Heritage Museum (Ambalavayal Heritage Museum) (in Sultan Bathery) and Valmeekam Clay Art Gallery (in Mananthavady). The adventure continues: take in the awesome beauty at Chembra, take in panoramic vistas at Lakkidi View Point, explore the activities along Pookot Lake, and contemplate in the serene atmosphere at Ananthanatha Swamy Jain Temple. To see maps, other places to visit, where to stay, and other tourist information, refer to the Kalpetta trip planner . New Delhi to Kalpetta is an approximately 7.5-hour combination of flight and taxi. You can also do a combination of flight, train, and taxi; or drive. Traveling from New Delhi in December, expect nights in Kalpetta to be much hotter, around 26°C, while days are a bit warmer, around 37°C. Finish up your sightseeing early on the 25th (Tue) so you can go by car to Alappuzha. Take a break from the city and head to Marari Beach and Alappuzha Beach. Relax by the water at Mararikulam Beach and Thottappally Beach. 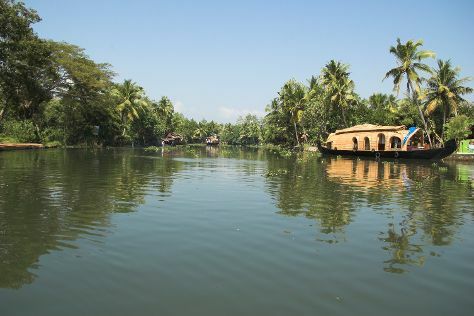 Spend the 26th (Wed) exploring at Kerala Backwaters. There's still lots to do: paddle through the water with a kayaking and canoeing tour, look for gifts at Pulickattil The Handicraft Shop, don't miss a visit to Alappuzha Lighthouse, and explore the world behind art at Revi Karunakaran Museum. Plan a Alappuzha trip in moments using our itinerary builder. Drive from Kalpetta to Alappuzha in 5 hours. Alternatively, you can do a combination of taxi, flight, and bus; or do a combination of taxi and train. December in Alappuzha sees daily highs of 37°C and lows of 28°C at night. On the 29th (Sat), wrap the sightseeing up by early afternoon so you can travel back home.